This study is a part of implementation of Gafchromic EBT2 film in the TBI in vivo dosimetry practiced in our institute. The most common dose protocol practiced in TBI is 12 Gy in 8 fractions with a fraction dose of 1.5 Gy. The total number of treatment days is 4 with 2 treatment fractions per day. The dose delivered to the patient is measured in vivo in the first fraction of each treatment day. During TBI in vivo dosimetry, EBT2 film pieces of 2 × 2-cm size with bolus are kept at various locations on the patient's body to measure the dose delivered across the whole body. One preferred characteristic for TBI in vivo dosimeters is the possibility of repeated usage. In case of EBT2 film, unlike the radiographic films, exposure to room light does not affect the film response. This characteristic of EBT2 films being insensitive to room light makes it possible to consider each EBT2 film for repetitive usage in cumulative dose measurements. Whereas the paper by FC Su et al., have studied the accuracy, reproducibility and linearity of Gafchromic EBT film, no papers have been published on the potential reusability of Gafchromic EBT or EBT2 films. If Gafchromic EBT series films can be reused, a single set of film pieces can be used to measure the cumulative dose in treatment techniques like TBI in vivo dosimetry where the dose delivered within each film piece is uniform. Also, the scanning images of the film after each fraction of irradiation can serve as a permanent dosimetry record of the treatment for each patient. With this background, the usability of EBT2 films in cumulative dose measurements is studied by comparing the response of the Gafchromic EBT2 films under single and cumulative exposure conditions. Gafchromic EBT2 films used in this study were taken from the same pack. EBT2 film sheets were cut into pieces of 4 × 4-cm size for dose measurement. 6 MV X-rays from a SIEMENS ARTISTE linear accelerator (Ms. Siemens, Erlangen, Germany) were used to irradiate the film pieces. The study was carried out in 30 × 30-cm sheets of solid water phantom (Virtual Water™, MED-TEC, Orange City, IA) of density 1.03 gm/cc at a standard irradiation set up of 100-cm source to surface distance (SSD). EBT2 film pieces were kept at a depth of 5 cm in the phantom and irradiated with 10 × 10-cm field size. All the irradiated film pieces were scanned in an Epson expression 10000XL flatbed scanner (Epson America Inc., Long beach, CA, USA) using a scanning protocol recommended by Devic, et al. Orientation of the original film sheet was marked at the top right corner of each film piece and all films were scanned in the same orientation (landscape) as recommended by the manufacturers. Films were kept in the center of the scanner at the same location using a template made of hard paper. Scanner settings were made so as to give images with a resolution of 300 dots per inch (dpi) in 48-bit tagged image file format (tiff). RIT (Radiological imaging technology, CO, USA) software was used to analyze the images of the scanned films. Dose response calibration curve of EBT2 films was generated for a dose range from 0 cGy to 1500 cGy. An unirradiated film piece was scanned and the scanner response from the film was noted as 0 cGy. For calibration, film pieces were kept at 5-cm depth in the solid water phantom at 100-cm SSD from the linear accelerator and irradiated with 10 × 10-cm field opening. Irradiated films were covered in a black paper and kept at the room temperature for 24 hours before scanning. A calibration curve relating the scanner response to the dose delivered was generated with 1 degree polynomial fit. This calibration curve was used to convert the scanner response of the films in to dose during the study. The average dose from the central 2 × 2-cm area of the EBT2 film pieces was noted as the measured dose from the film. The general practice in Gafchromic film dosimetry is to measure the dose at 24 hours post-irradiation, after which the increase in darkening of the film is at a slower rate. However, it is essential to study the darkening of the film beyond 24 hours if the film has to be reused to measure cumulative irradiation delivered over a period. Three EBT2 film pieces were irradiated to doses of 200 cGy, 400 cGy and 800 cGy, respectively, in phantom at the standard irradiation set up described earlier. All three irradiated films were scanned at different time intervals up to 96 hours from irradiation. The dose measured from the scanned images of the film was analysed to study the post-irradiation darkening of the film for 4 days. If the EBT2 film has to be reused to measure the cumulative dose received over multiple treatment fractions, it will be subjected to scanning after each fraction of treatment. Hence, the influence of repeated exposure to scanner light on the dose response of EBT2 film has to be established for the expected period of usage of the film. Three EBT2 film pieces exposed to doses of 100 cGy, 150 Gy and 200 cGy, respectively, were checked for the variation in film response with repeated scanning. All the three irradiated EBT2 film pieces were subjected to five successive scans every day for 4 days. The measured dose from the successive scans of the EBT2 films was compared with the dose measured from the first scan of the day to study the effect of repeated scanning on the measured dose. EBT2 film pieces were studied to check whether it can be used to measure the cumulative dose delivered over 4 days. To study the reusability, Gafchromic EBT2 films were divided into two groups namely, single exposure films (SEF) and cumulative exposure films (CEF). Three cumulative exposure films CEF 100 cGy , CEF 150 cGy and CEF 200 cGy were irradiated with daily fraction doses of 100 cGy, 150 cGy and 200 cGy, respectively, for 4 days. The CEFs were scanned each day, just prior to irradiation to measure the dose delivered from the previous fractions of irradiation. Another set of EBT2 film pieces were exposed to single fraction of irradiation for doses of 200 cGy, 300 cGy, 400 cGy, 450 cGy, 600 cGy and 800 cGy. These EBT2 films are designated as SEF 100 cGy , SEF 200 cGy , etc., based on the dose to which they are irradiated. The dose response of EBT2 films exposed to cumulative pattern of irradiation were compared with the dose response of EBT2 films exposed to the same dose, but in a single fraction of irradiation (e.g., dose measured from CEF 150 cGy after four fractions of irradiation and dose measured from CEF 200 cGy after three fractions of irradiation were compared with the dose measured from SEF 600 cGy ). It was ensured that, to compare the response of films exposed to the same dose in single and cumulative irradiation, the respective scanner response of SEFs and CEFs were measured at equal duration post-irradiation. In case of CEFs, the post-irradiation duration was counted from the first fraction of irradiation. (The scanner response of CEF 100 cGy with 4 days of fractionated irradiation was measured on the fifth day and compared with the scanner response of SEF 400 cGy measured on the fifth day from irradiation. Similarly, the scanner response of CEF 200 cGy after 2 days of fractionated irradiation was measured on the third day and compared with the scanner response SEF 400 cGy measured on the third day from irradiation). Three EBT2 films were used to study the post-irradiation darkening of the film. EBT2 films were exposed to doses of 200 cGy, 400 cGy and 800 cGy, respectively. All the three irradiated films were scanned repeatedly for up to 96 hours post-irradiation at different time interval. 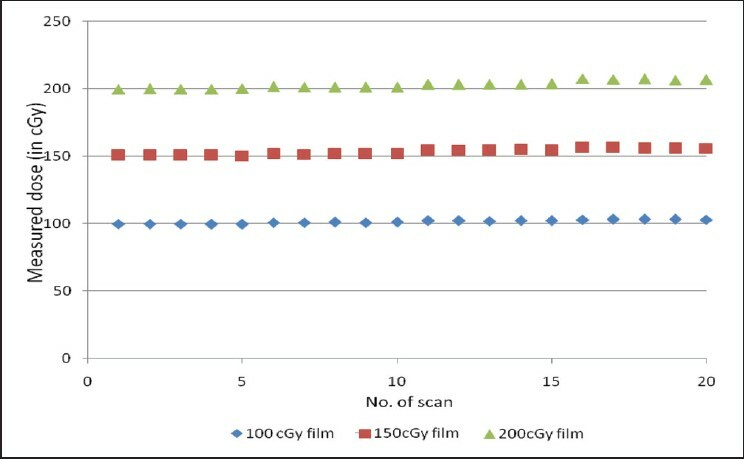 The change in scanner response of each EBT2 film up to 96 hours after irradiation was compared with the scanner response observed at 24 hours post-irradiation from the same film. The darkening of the EBT2 film initiated after irradiation was not saturated over the whole period of study. However, the rate of darkening was slower in the later part of the study compared to the earlier period. 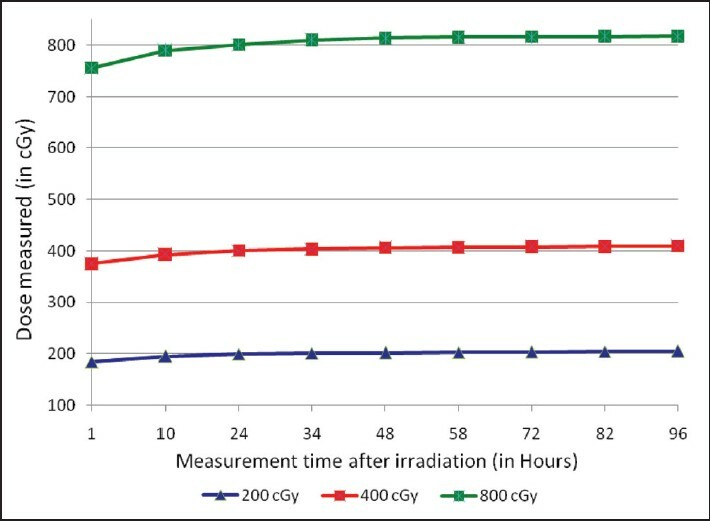 There was an increase of more than 2% in the dose-response of each film at 96 hours post-irradiation compared to the dose-response at 24 hours post-irradiation [Figure 1]. The absorbed dose measured from all five scans in any single day was found to be uniform with very minimal difference in all the three EBT2 films [Figure 2]. The maximum standard deviation among the dose measured from successive scans done in any day was of 0.3. The dose measured from CEF100 cGy after second, third and fourth fraction of irradiation was 206 cGy, 308 cGy and 414 cGy, respectively. The dose measured from SEF 200 cGy , SEF 300 cGy and SEF 400 cGy to evaluate the CEF 100 cGy were 205 cGy, 315 cGy and 427 cGy, respectively [Figure 3]. The dose measured from CEF 150 cGy after second, third and fourth fraction of irradiation was 306 cGy, 465 cGy and 618 cGy, respectively. The dose measured from SEF 300 cGy , SEF 450 cGy and SEF 600 cGy to evaluate the CEF 150 cGy was 308 cGy, 469 cGy and 632 cGy, respectively [Figure 4]. The dose measured from CEF 200 cGy after second, third and fourth fraction of irradiation was 404 cGy, 619 cGy and 818 cGy, respectively. 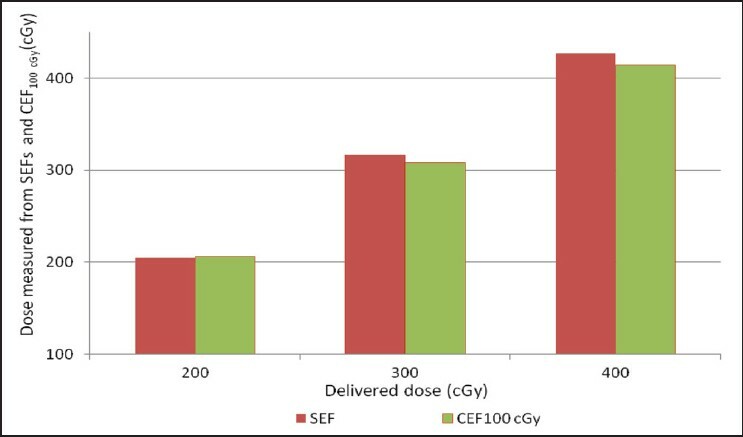 The dose measured from SEF 400 cGy , SEF 600 cGy and SEF 800 Gy to evaluate the CEF 200 cGy were 406 cGy, 625 cGy and 842 cGy, respectively [Figure 5]. 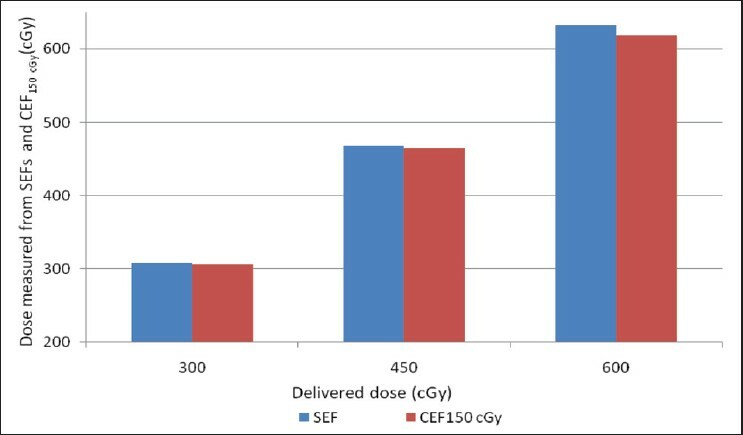 The dose response of SEF 400 cGy measured 4 days after irradiation was 3.04% higher than the dose response of CEF 100 cGy after a cumulative exposure of 400 cGy. The difference in dose response of SEF 600 cGy and CEF 150 cGy after 600 cGy of irradiation was 2.22%. 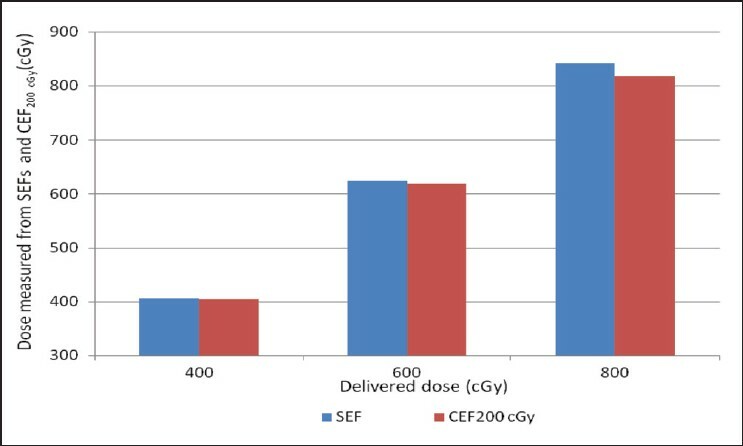 The dose response of SEF 800 cGy was 2.85% higher than the dose response of CEF 200 cGy measured after four fractions of irradiation. It was observed that, repeated exposure to scanner light has no significant impact on the dose measured from EBT2 film. The dose response of EBT2 films exposed to cumulative irradiation is comparable to the dose response of the EBT2 films exposed to the same dose in a single fraction of irradiation. Except one instant, the dose response of films exposed to SEFs are found to be slightly higher than the dose response of the films exposed to the same dose, but in cumulative pattern. Also, the deviation between the dose response of CEFs and SEFs found to be higher with more number of repeated usage. This could be explained with the results obtained from the study on the persistent post-irradiation darkening of the EBT2 film. In studying the change in response of EBT2 film over 96 hours, it was observed that the polymerization process that leads to darkening of the film continues to take place beyond 24 hours. Similarly, though the earlier study by Devic et al., did not quantify the difference in dose measured between 24 hours and later periods, it concluded that the darkening of the film persists beyond 24 hours. Although the post-irradiation duration before scanning of the film was kept equal between the SEFs and CEFs, the darkening of the SEFs will be higher compared to CEFs, as in case of SEFs the whole dose is delivered initially and it may be resulted in slightly higher level of polymerization of the SEFs film. For the three EBT2 films exposed to four fractions of cumulative irradiation in this study, the scanner response was 2-3% lesser compared to the scanner response of single exposure EBT2 films. The usability of EBT2 films in cumulative dose measurement is tested in this study only for radiation fields that delivered uniform intensity across the film. However, EBT2 films are used in QA checks of radiotherapy treatments that involve radiation fields with non-uniform intensity also. During verification of IMRT patient specific QA, EBT2 film is used to measure complex and high-gradient dose distributions resulted from treatment fields of non-uniform intensity. To use EBT2 film in cumulative measurement of radiation fields with non-uniform intensity, the two-dimensional dose response of the film for each fraction of irradiation has to be tracked till the entire period of usage. Then only it is possible to identify if there are any error in the dose delivered during any one of the fractions of irradiation. The presently available film analysis computer programs do not have the facility to track the two-dimensional gradient dose distribution from each fraction of irradiation, when the films are exposed to multiple fractions of such irradiation. Hence, it is difficult to implement EBT2 films for cumulative measurement in radiation fields involving non-uniform intensity. The EBT2 film pieces used for TBI in vivo dosimetry are of 2 × 2-cm size, and the dose across the film is expected to be uniform considering the very large field sizes used in TBI. Therefore, EBT2 films shall be tested in TBI in vivo dosimetry to measure the daily fraction dose and the cumulative dose delivered over the entire treatment. A simple technique of comparing the response of EBT2 films exposed to a same dose by single exposure and cumulative exposure is shown in this study to analyse the usability of EBT2 films in cumulative dose measurements. Other factors of importance like influence of post-irradiation darkening and effect of repeated scan on the dose response of EBT2 films were also studied. The effect of post-irradiation darkening of the film is persisting beyond 24 hours. The effect of repeated scans on the scanner response of the film is negligible. The results also show that, continued use of an EBT2 film to assess accumulating dose is possible particularly in technique like TBI in vivo dosimetry. However, EBT2 films cannot be reused in measurement of non-uniform dose distributions. The present study which is done on a phantom will be extended to in vivo dosimetry in TBI and will be reported in future along with other findings of the usage of EBT2 films in TBI in vivo dosimetry. 1. Richley L, John AC, Coomber H, Fletcher S. Evaluation and optimization of the new EBT2 radiochromic film dosimetry system for patient dose verification in radiotherapy. Phys Med Biol 2010;55:2601-17. 2. Uniyal SC, Sharma SD, Naithani UC. A dosimetry method in the transverse plane of HDR Ir-192 brachytherapy source using gafchromic EBT2 film. Phys Med 2012;28:129-33. 3. Kairn T, Hardcastle N, Kenny J, Meldrum R, Tome WA, Aland T. EBT2 radiochromic film for quality assurance of complex IMRT treatments of the prostate: Micro-colliamated IMRT, RapidArc and Tomo Therapy. Australas Phys Eng Sci Med 2011;34:333-43. 4. Su FC, Shi C, Ppanikolaou N. Clinical application GAFCHROMIC EBT film for TBI in vivo dose measurements of total body irradiation radiotherapy. Appl Radiot Isot 2008;66:389-94. 5. Andrés C, del Castillo A, Tortosa R, Alonso D, Barquero R. A comprehensive study of the Gafchromic EBT2 film. A comparison with EBT. Med Phys 2010;37:6271-8. 6. Ganapathy K, Kurup P, Murali V, Muthukumaran M, Bhuvaneshwari N, Velmurugan J. Patient dose analysis in total body irradiation through in vivo dosimetry. J Med Phys 2012;37:214-8. 7. Devic S, Seuntiens J, Sham E, Podgorsak EB, Schmidtlein CR, Kirov AS, et al. Precise radiochromic film dosimetry using a flat-bed document scanner. Med Phys 2005;32:2245-53. 8. Devic S, Aldelaijan S, Mohammed H, Tomic N, Liang L, DeBlois F, et al. Absorption spectra time evolution of EBT-2 model GAFCHROMIC TM film. Med Phys 2010;37:2207-14.